Schattendal Kennels is owned by Jani & Andrea Turkia. We live in the beautiful countryside of Vilonia, AR (about 20 miles north of Little Rock). We are advocates of the working dog and train very seriously with our dogs for the sport of Schutzhund. We both have trained our dogs from puppies and are members of Schutzhund USA, DVG, UDC, and WDA. 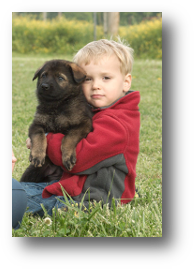 Schattendal puppies are bred to perform in Schutzhund, Police K9, Search & Rescue, tracking, agility, AKC obedience, and of course loving home companions. 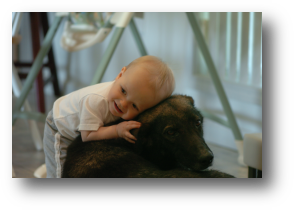 We breed only titled hip-rated dogs with sound temperaments and excellent health. We breed for high drives, strong hunting/searching ability, solid nerves, and intense tracking. Our puppies are heavily socialized and exposed to many different types of surfaces, locations, noises, childrens' playground equipment, agility equipment, etc. They are imprinted in tracking from a very young age to enhance and maximize the development of this ability as an adult. We constantly play and stimulate our puppies to build drive, grips, and confidence. We have only a couple of litters per year due to the extensive amount of work put into each and every individual puppy. We are extremely proud of the accomplishments of our puppies.